Sol Feliz Farm is a manifestation of agricultural reconnection and home-scale sustainable living. I (Miguel Santistevan) spent most of my summers and holidays with my grandparents here, playing on this land and in and around the acequia irrigation ditch that runs behind the house. My grandpa built this house and was a master of adobe, mud, and plaster, having built many kiva fireplaces for the famous hotels and artists as well as laying the bricks in the Taos plaza. My grandma always had the BEST homemade northern New Mexico foods: chile, tortillas, tamales, posole, frijoles, empanadas, and many other delectable treats. I also have to thank my other grandma who lived across town, Lupita Garcia, who introduced me to chaquegue, caldito, and fideo. These efforts are dedicated to the memories of my beloved abuelitos: Samuel and Simonita Trujillo and Lupita Garcia! I have lived here since 2003 and have been expanding my agricultural operations with my wife (Margaret Garcia) and our daughters (Anastacia Maíz & Simona Remedios). We are working to grow the ingredients of our traditional foods so we can eat the way our grandparents, great-grandparents, and beyond used to eat. We believe that sustainable agriculture starts with our kitchen table. This isn’t just a romantic exercise, we don’t like the way the food system treats the Earth and its negative health effects on the people, and we are working to actualize an alternative. This isn’t really work, however, this is how we live as artists and play outside. Hey Miguel, Mike Musialowski here. We met a couple of times at the district testing trainings. 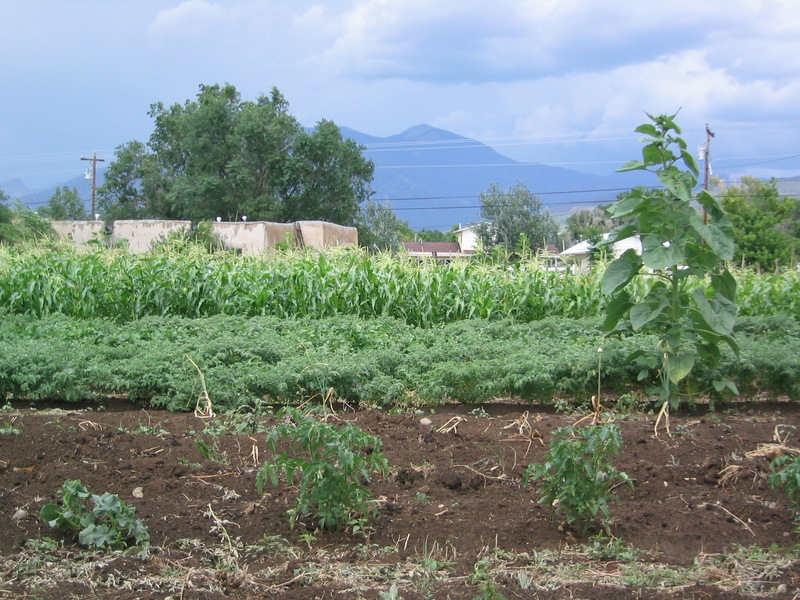 My wife and I have decided to have a contractor build our house and thus have time to focus on planning a garden on our 1 acre lot in Talpa. I was wondering, could help us with the planning process? I realize you’re quite busy and we’d be happy to compensate you and hire you as a consultant. I think you’d really enjoy this challenge of how to revitalize a long-neglected piece of traditional land (it’s 650 feet long and 70 feet wide, perpendicular to the rio and acequia.) We really want to utilize and honor the generations of experience in the area and do right by this land. Lemme know what your schedule looks like as we are very flexible. Thanks, man! Hey, Miguel. That sounds great. I love the idea of bringing students/interns to see how consulting is done. If you could give us a call or e-mail me your phone number so we can coordinate, that would be great. – in process: mulching our wood scraps and seeding recently/cleared/disturbed topsoil with cover crops to compete with weeds and break up compacted soil. – advice on how to move water among the trees, other planting areas, and how to integrate the two. – any other ideas/wisdom on how to work with this land.